Neither law nor might can ever make a wrong right. A huge difference exists between knowing what a document says and understanding what it says means, as is demonstrated by the vast amount of exegetical works in existence. And the kinds of techniques used by exegetes is as varied as the creative abilities of the human mind. Among these techniques is a relatively recent innovation called the word cloud. It consists of a list of key words found in a document and is often displayed in graphical form. This approach is useful when describing a document by its “key” words. A simple variation on this procedure is often more revealing. For instance, consider the Constitution of the United States. Search it for words which express moral or intellectual values. The findings are highly revealing. A more interesting passage, however, is the First Amendment which states that “Congress shall make no law […] abridging the freedom of speech or of the press,” which means, of course, that the press can be as dishonest and unfair and untruthful as any reprobate. What’s worse, if anyone tries to require that the press be honest and fair and truthful, that requirement would be rendered unconstitutional. The faults of the American press, established or alternative, cannot be addressed. The Constitution insures the existence of a dishonest America, and dishonest it has always been. What does the absence of moral and intellectual values tell us about the people who drafted the Constitution? Well, it tells us that they had no concerns for the state of the human condition in America at the time or its improvement. Apparently they were willing to condone the hardships, slavery, and killing (especially of natives) that was prevalent at the time. Making life better was something the Founding Fathers were not interested in. All they made was another eighteenth century England without its king. America was a harsh place. It still is! The culture, if it can be called that, embodied no moral or intellectual values. It embodies none today! In 1803, William Marbury, who had been appointed Justice of the Peace in the District of Columbia but whose commission had not been delivered petitioned the Supreme Court to order its delivery. The Court found that the government’s refusal to deliver the commission was illegal and that Marbury was entitled to it but did not order its delivery. Instead it worked some legal hocus pocus in order to claim that it lacked the power to do so. To ordinary people, justice is an outcome. A person should receive what he is due. Marbury did not receive what the Court said he was due. The Court issued an unjust opinion. In America, justice is never an outcome; it is always a legal procedure; it is always legal hocus pocus. On March 24, 1989, the Exxon Valdez ran aground and spilled its oil in Prince William Sound, Alaska. The spill destroyed the livelihoods of thousands of people. In Exxon v. Baker, an Anchorage jury awarded $287 million for actual damages and $5 billion for punitive damages. Exxon appealed, and the 9th U.S. Circuit Court of Appeals ordered the trial court to reduce the punitive damages. On December 6, 2002, they were reduced to $4 billion, Exxon appealed again and again as rulings were issued. After approximately 20 years of legal hocus pocus about decades old maritime law, the Supreme Court reduced the punitive damages to about $500 million, a mere sliver of the original 5 billion award. People with legalistic mindsets can perhaps find a compelling justification for the Court’s opinion, but no one can justify the hardship the courts imposed on the plaintiffs during the case’s litigation. While awaiting their awards, many plaintiffs died and all suffered. No jurist has ever accepted any responsibility for this hardship. The welfare of the plaintiffs in this case was of no concern to the jurists involved. Just as the framers of the Constitution were not interested in the well being of the Americans about to be governed by the United States of America, the judiciary has no concern for the welfare of plaintiffs. The legal hocus pocus is its only concern. In America, what happens to people is of no concern to those who populate its institutions. The absence of moral and intellectual values in the Constitution is what makes this lack of concern possible. The Sixth Amendment gives criminal defendants the right to speedy trials which is often expressed by saying justice delayed is justice denied. Unfortunately Exxon v. Baker is not a criminal proceeding. The fair Constitution gives criminals rights that injured plaintiffs don’t enjoy. In this litigation, the plaintiffs who died did not receive their due and those that lived through the litigation received only a pittance. The judiciary’s fixation on the law trumped any concern for the sufferings of the people involved. Instead of the outcome the plaintiffs sought, the court produced a 20 year long procedure. Does the Preamble say establish justice or establish procedures? The American courts are judicial travesties. What people understand as justice does not exist in America. This American fixation on the law is often expressed by saying that America is a nation of laws. Unfortunately that notion is often used to justify extreme evil. For instance, slavery is evil and the Supreme Court justified it in Dred Scott v. Sandford (1856). Laws can be and often are immoral! A nation of immoral laws is immoral too. Law does not make right. To conclude, what it does is a classical non sequitur. Much that is legal is absolutely wrong. Tom Price, as a Congressman, invested $90,000 in six pharmaceutical companies shortly before leading a legislative effort that benefited those specific companies. Perfectly legal, he claimed. Perhaps! Moral? Absolutely not! American corporations when accused of wrongdoing routinely plead that all laws and regulations were properly followed. Being legal does not make a wrong right and never will. American politicians wallow in corruption and no one seems to care. No one ever asks how Congressmen become rich on modest Congressional pay. Where are the investigative journalists? Well, not on “60 Minutes” or CNN. Unfortunately, corrupting the Congress was made into a Constitutional Right by the Supreme Court in Citizens United v. Federal Election Commission. Life for most people is a hardship that needs to be ameliorated. If improving the human condition is not a goal of a culture, the culture is fraudulent. The words ‘culture’ and ‘cultivate’ are used to express the same concept. These words denote the medium for growing, nurturing the attributes and activities that make human beings superior to beasts. The words differ only as grammatical units. If a culture does not promote and cultivate the moral and intellectual achievements of its people, it is not a culture at all. Constitutional Rights to engage in immoral activity are standard American principles. Vendors are allowed to lie to consumers. Legally, the lying is called puffery. Legislators can lie to their constituents. It’s called fauxmissing! Clerics lie to their congregations. It’s called gantreeing. What’s worse, professors lie to their students. Just ask yourselves what the American colleges and universities teach their students. How would one find out? Well, the proof is in the pudding! The Congress is comprised of people all or most of whom have one or more degrees from American institutions of higher learning. Were they taught to be honest, truthful, just, kind, and compassionate? If so, why aren’t they? So called “educated Americans” are the pudding. This pudding lacks any proof that the colleges and universities cultivate truth, honesty, fairness, compassion, sympathy, or any other moral or intellectual values. The proof of what these institutions teach is manifested by how the educated act. Their actions show that they have only been taught the sanitized conventional American myths, not the raw and ugly reality. Despite what is commonly believed, the Puritans were not nice people seeking religious freedom. The American Dream for most people has been an absolute disappointment. The Shining City on a Hill in reality is something more like a slum in a swamp. America did not save the world from fascism in World War II. The free market can not solve social problems. These conventional myths are all false. American history is a lie taught by American historians in every college in America. But the bigger lie is the myth that American colleges and universities are swarming hives of liberalism. Although many colleges and universities were openly founded in America to promote religious ideologies and vocational training, not one was openly founded to promote enlightenment principles. None overtly promotes those principles today. As a result, Americans lack an intelligentsia. The academic community’s voice is politically silent. It has no influence on policy. 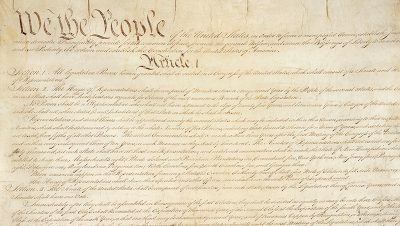 The much praised and highly venerated American Constitution is an often ambiguous and deeply flawed document. Its lack of moral and intellectual values makes it a license for wrongdoing by those with base motives. The absence of standards makes the quality of policies impossible to measure thereby making outcomes irrelevant, so facts never matter. Cruelty is just as acceptable as kindness. The reality is that America has no culture and is not even a society. It is a nociety! Americans do not live together, they live side by side. Caring about the welfare of your neighbor is impossible if you don’t know him. More likely, the truth is that they will do the wrong thing until they’ve exhausted all alternatives. Of course, this makes reforming America very difficult.